We occasionally get asked about diving in Loch Earn so I though I’d put something up that I recently sent to a fellow diver from Aberdeen. Loch Earn is a typical Scottish fresh water loch. The access is very good from both sides from any of the numerous laybys. We have used it for training dives, short evening trips and the opportunity to clean off salt on the way back from the West Coast. It has a lot of peaty water running into it so the visability can at times be like diving in tea water and consequently when it has been raining can be pitch black anywhere below 3-10 m. That doesn’t mean it’s not clear, just dark/black. The water is cold in winter and has a marked thermocline in summer. Interestingly enough, Loch Earn also has a current in it! Is it tidal or gyratory I wonder?? It has a predominantly silty bottom and we have not found any walls though in the shallows you do get small reef systems. The life is Spartan, a few fish, trout mostly with the occasional eel and freshwater sponges and hydroids if you look carefully. You are more likely to see golf balls and fishing gear though. There is a wreck of a coal barge at the St Fillans end, I’ve not done this. It’s tentative position is between the stream outfall at the St Fillans end of the loch (Near the public toilets) and the small island in about 15m. I’m told it’s easy enough to find from a boat with a depth gauge but as I say I’ve not done it. You do find stuff that has fallen of boats such as batteries and even outboards and we were asked to recover a hydroplane once. At the Western end of the loch at Loch Earnhead there was a WW2 army camp and apparently they dumped lots of equipment at the end of the war, Again I’ve not looked here due to the watersports boat traffic and poor access. We decided to try September this year to see if we could get calmer weather for our trip to Scourie, unfortunately not, however we were able to launch the Rhib from the beach at Tarbet. On the Saturday the winds were blowing 15-16 mph from the South and as the tide changed on the flood we noticed the wave action increased so we were only able to dive safely around Great Stack on the North side of Handa Island. We dropped our divers South of the Great Stack so that we could swim through the cavernous interior, there was some swell and the seabed was covered in smooth rocks a orange Scorpion fish was the only life we saw, heading down into area to the north of the stack we could see the waves crashing into the top of the rocks some 20 metres above us. I could see some jewel anemones, mixed with large colonies of Orange Parasmittina trispinosa and white branching Bryozoa, we headed west over some boulders to a cave at the base of the cliffs, then headed back around the rock to the north of the Stack, Eddy found a Crab for his BBQ and we headed for the surface. After lunch on the beach at the East Side of Handa Island we headed across to the Pinnacle about half a mile North of Tarbet, which was now dive-able with the change in tides. We dropped a shot onto the east side at about 10 Metres depth, the rock is covered in lots of interesting channels and we followed one of these down to 30 metres. Despite the gloom we could see the rocks down to 50 metres depth, then to our left a Crawfish standing proud on a ledge, we headed further round the pinnacle to spot a second Crawfish before heading back up to the surface. On the Sunday the rain had passed, so we had the sun, but the wind and swell limited our options so we decided to head to Loch Laxford from Tarbet for a dive. Hayden, Mark and I dropped down to 30 metres, after heading along the reef covered in feather stars, we found a couple of Ling and Hayden spotted a Octopus hiding in the rocks. As we returned to the surface there were shoals of whiting swimming above the kelp. 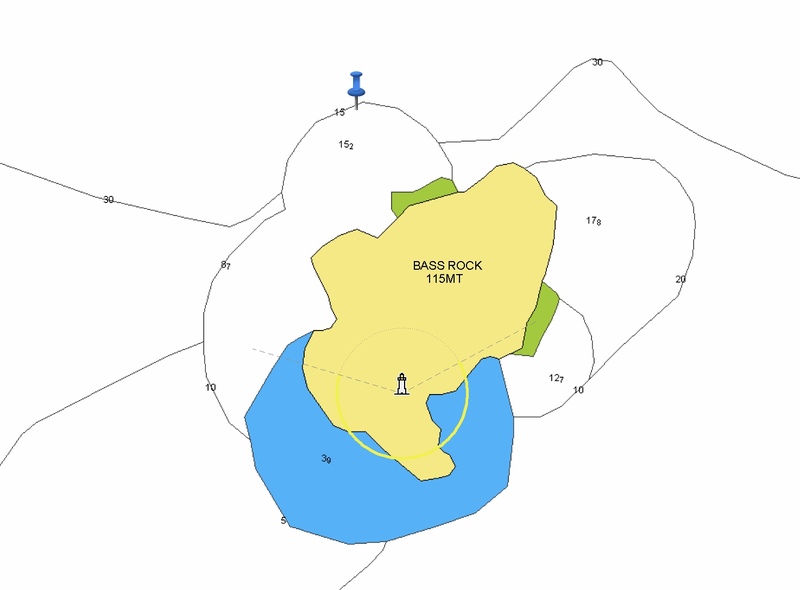 We had a dive on Wednesday to the Bass Rock. It was pure white with Sea Birds (Gannets) nesting on it, millions of them. The wall was magnificent with anemones of various kinds, lobsters, crabs, fish. Thanks to Steve for taking care of me on this dive. We had a birthday cake to celebrate Anna’s birthday on the way back. It was a pleasure to make it for you. I hope you had a good time. the stumpy tailed Moducks were happy to serve. The sunset on the way back was spectacular. Next week weather permitting, Kingsbarns BBQ. Thanks to Steve for organising The Mako and to Skipper Steve for his skill in maneuvering the boat to pick us up. Dive site has current so must be dived on slack. Ideally High Water for best Visibility. Blue Pin Marks the Wall, Look for the Triangle Slab on the North Wall. Steve and I had been planning to do the Meldon for several months now and the opportunity came up. So Paul, Steve, Gary, Izzy, Mark and Taylor headed out at 9am on Deep Dancer, our Club Rhib, from Puffin Dive Centre near Oban. 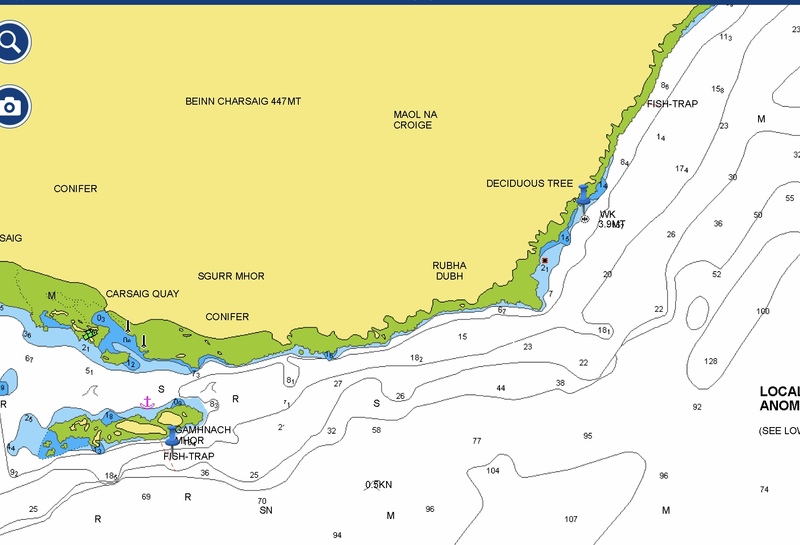 The trip in good seas takes about 40 minutes and is 15.4 NM, in the morning we had calm seas although we were aware of the Rain and Cloud Forecast for the rest of the day. The Meldon is a great wreck for Novice / Ocean / PADI Open Water divers as there is little or no current on her and she is a relatively intact wreck. The Rudder post breaks the surface at low water and there is lots to see including the Cast Iron Propeller and Rudder, Boilers which are open on the Port Side and the Bow which has fallen over but is very scenic, surprising to see when you consider that she would be exposed to Winter storms from the South. The Meldon Launched in 1902 at Newcastle is a 1572 Tonne 310 ft Long Steamship, Steel hull construction. On the 3rd of March 1917 while carrying a cargo of Coal from Wales she struck a mine in the Firth of Lorn laid by a German U Boat. The Captain headed for the south Coast of Mull where the Crew got off the boat, she sank with the Stern near the shore, perhaps the Captain thought he could save the ship and was making repairs before a pump failed? Collapsed hull structure of the Meldon, near the Engine Compartment. Diving the wreck there is broken shell coarse sand around the wreck with plenty of Sugar and Forest Kelp covering her, on the Stern section she has Elegant Anemones and Dead Mans fingers. The Visibility was about 6-8 metres and you could see she is home to Ballan Wrasse and Pollack, this wreck is 300 ft long and towards the bows section she is more broken up. Definitely a pretty and enjoyable wreck, easily covered in one dive and if we’d have had bright sunlight the wreck would have been a lot more colourful too. We headed further along the coast to Carsaig Quay for a picnic stop, the clouds were low and a steady drizzle coupled with Midges didn’t make this an ideal stop. Although in better weather we would have a chance of spotting Eagles hunting on the Southern Slopes of Mull. We Dived the Fish Trap Just South of Carsaig Quay as a second dive which was a gently sloping reef dropping to sand at 20 metres. Gary and Izzy found an Octopus on their dive. 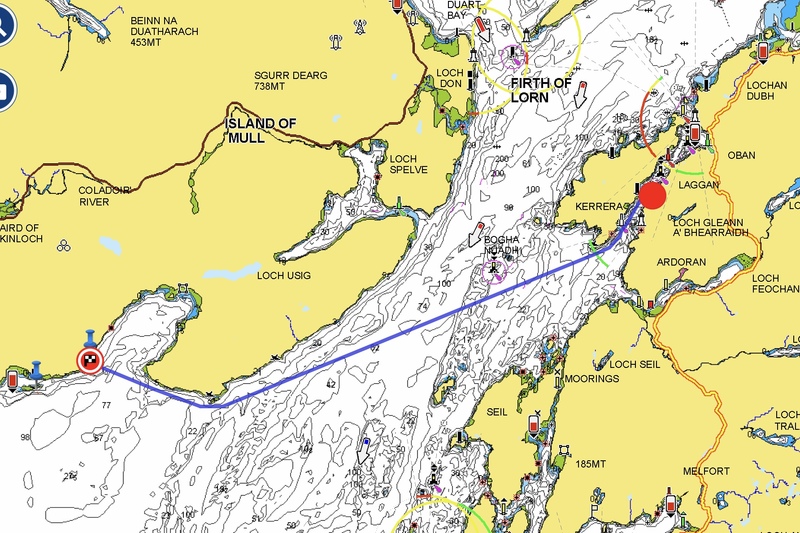 With the Tide and Swell changing Deep Dancer was slower on the return run to Oban taking about 1.15 minutes. It’s great to get out and find new dive sites. 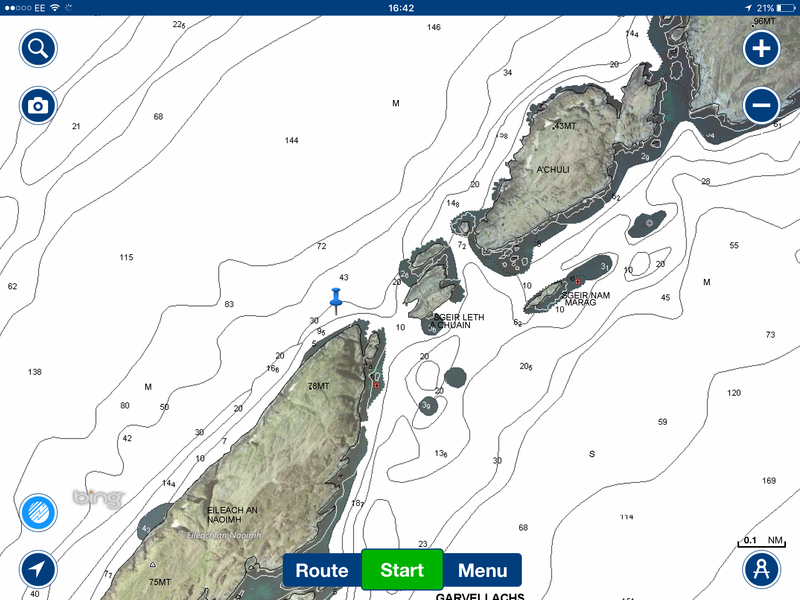 After two weeks of settled Weather, we decided to head out from Oban on Deep Dancer down to the Gavellachs (Islands of the Sea) and try one of the Channels between the Islands. Usually strong currents provide divers with lots of life to see and we were not let down this time, however as with all these dives care must be taken to dive them on neaps and close to slack water. Dropping at the Blue Pin we dropped down to 16 metres and the Viz was about 5-6 metres with lots of Kelp and then Patches of Reef covered in Dead mans Fingers and Elephants Ears Chris and I worked our way round towards the channel where the current picked up condisderably. We followed the Kelp using it to help keep out of the main current and slow our drift. We had heard that the Crawfish were out but didn’t manage to spot any this time. A small team took a day off to go for a sneaky dive in Loch Long at the A-frames. The dive was a checkout for a newly qualified CCR diver so a relaxed trip with a certain amount of kit reconfiguration in evidence. As expected attention was paid to harness adjustments and coming to terms with the order of pre-dive checks before actually getting into the water for a weight check. It was also really useful to rethink the buddy check as applied to CCR diving. The dive itself was a very gentle bimble to a maximum depth of 15m to look at the pylons, stopping regularly to check PPO2 readings, cell mVolts and practicing basic drills. With the extra time in the water offered by the CCR there was still loads of time to enjoy the marine life with numerous transparent shrimps hiding under rusting plates. Getting really close to these was very pleasing and we watched then for several minutes before bimbling on. The usual mix of squidgy life and swimming crabs provided interest as well as some enormous edible crabs that had started to dig into the mud to incubate their eggs. An hour later and with a boat propeller sounding about us we thought it time to make an ascent, not 10% sure of how far we had drifted and then swum back. Surfacing the weather had deteriorated and grey rainy weather, fading in twilight had replaced the broken cloud that we had entered on. We were about right with the navigation and only a short swim brought us back to the entry point, where in the shallows the cold surface water took it’s toll on the hands. All in all a very cheeky and enjoyable dive snatched from some very changeable conditions.